Those in the know are well aware of the fantastic opportunity that presents itself each year. Last year was Farmer & The Scientist’s debut and it was huge. We got to meet so many people and introduce so many of you to new varieties like Tempranillo. Because we don’t have a cellar door yet, events like this are the highlight of our year. We get to talk with people about our wines and see what they think. The timing of the Festival has incidentally ended up as a yearly ‘first-release’ of our whites and Rosé. This year is the grand-daddy of excitement as our sold-out Sauvignon Blanc & Rosé are back along with a new sibling (that one is a show surprise). We are self-declared festival goers where wine is concerned yet I’m failing to recall a food and wine festival where there has been a larger number of regional producers present. 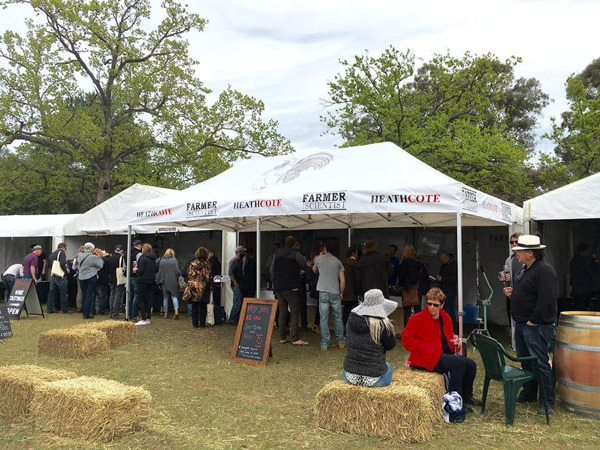 The Heathcote Festival hosts 40+ regional producers. It is so packed with wines that repeat attendees have devised plans for visiting them all. To complete the circuit – is the ‘10lbs burger competive eatfest’ of the wine world – it’s never been done. Approaches range widely and I can’t wait to see what everyone comes up with this year in order to complete the ‘Wine Ninja’ course. Last year ‘lapping’ was popular – completing a white lap first (tends to better with early morning foods), followed by the reds later (personally I think you waste too much time in the line-up with this method). Then there is the sommelier approach – try everything, spit and take rigorous notes. The social version – have a great day with friends, keep it loose but use your camera to take photos of the bottles you like. You then follow this blurry grape trail back through your digital album to purchase so you don’t have to lug your wines around. Hot -tip on this one: rather than risk forgetting your favourites you can always schmooze the wineries into letting you pick up your goodies at the end of the day – few would mind. Either way, it IS important to have an approach. The Shiraz Fest is a big course, so think about how you are going to tackle it to get the best out of your weekend. You could split it over two days, but book your accommodation early – Heathcote has around 150 beds for rent and we get 4,000 + visitors to the festival. Alternatively, to avoid the hassle and paper-scissors-rock over who is going to drive, you could jump on one of the organised buses out of Melbourne or Bendigo. Mick at the Rochester Wine Tavern also runs tours on the day and is extremely well-priced. Some have even turned up in Limousines! Having the range of producers on site is such a great way to ‘taste’ through the region, especially if you are short on time. You can find your favourites, discover new wines and use this as a base for planning a more involved trip where you can visit directly and get more in touch with the wines you like. It’s also a great way to avoid the ‘guilt-buy’ when you’re stuck at a cellar door alone. You certainly aren’t expected to buy just because you have tried the wines but some of us are better with that than others. My husband is a shocker for the guilt buy, he HAS to do it. I have never walked out of a cellar door with Brian empty handed. Me on the other hand, I’m comfortable enough to say thanks so much and leave it at that – I know this is rarely a slight on the wines, it is most often just personal preference. Wine is taste and yours is unique. Yet if you always leave a wine region with a collection of Rosés you really didn’t want then this event is for you. To find out more about the exhibitors, transport options and ticketing visit the festival page.